I know this is late but I would like to give a heads up regarding a free e-book that has been given away by my co-blogger Marhgil Macuha and Atty. 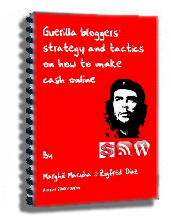 Diaz , I have scan the e-book ( I told you I am busy ) and I must say that there are great tips inside the e-book aside from the tips that you can read from Marhgil post. So if you really want to have some traffic at your site, why not try to read their e-book. BTW I have my E-book also check it out here. Hey Dexter thanks for helping us promote our ebook ! Love what you did with your comments. What plugin did you use ? More power to your blog ! magaling kalang mambola sa Google hehehe… More money to you brother! i also have that ebook from Marhgil.. ok sya! thumbs up! I also have yours Dex, ayus din! i also have this one.. useful tips! apply ko yun little-by-little..
hehehe.. sana dumating yung time na yun! meron ka din po ba na e-book about SEO?! jheLos last blog post..How to have a FREE Domain Name and a FREE Reliable Web Host.. . . .